The place is Grand Forks, North Dakota. A new restaurant has opened in front of a local mall. The local newspaper, the Grand Forks Herald sent its octogenarian columnist/restaurant writer to do a review. I’m not a big fan of restaurant critics. The late Dennis Getto of the Milwaukee Journal might be the only one I genuinely liked (a lot) and read religiously. Most others I find consistently too negative and not all that helpful. Thus, I decide whether to patronize and see for myself if the experience is enjoyable. But can a critic be too nice, to the point of being dull with writing skills of a 5th grader? That brings us back to Grand Forks and its brand new Olive Garden. Marilyn Hagerty, long time writer who was now in her mid-80’s gave one of those Alex Thien assessments in her review. The chicken Alfredo ($10.95) was warm and comforting on a cold day. As a fellow midwesterner I can say that though the Olive Garden here is by no means “the largest most beautiful restaurant in town” it is constantly busy. All day, every day. Never underestimate the desire of folks in the midwest to enjoy bland food. The Olive Garden — What you get when General Mills decides to make a dining experience. So much of that review read like mediocre fiction. It just needs a few tweaks to kick it up a notch. Honestly, it reads like a column from the Onion. I think it would be amusing to put a Sbarro in there too and watch their little noggins explode. Just wait till they get a Bucca di Beppo. “Grand Forks is the third-largest city in the state of North Dakota … [with a] metropolitan area [population of] 98,461.” ~Wikipedia. Yeah, I’d be excited about a new restaurant opening if I lived there, too. Anything to get the taste of lutefisk out of my mouth. Not every reaction was a pie in Hagerty’s face. Soon she became a bona fide celebrity. In this report we find Hagerty was quite humorous, and she also had opinions about guys like…me. Click here to watch. 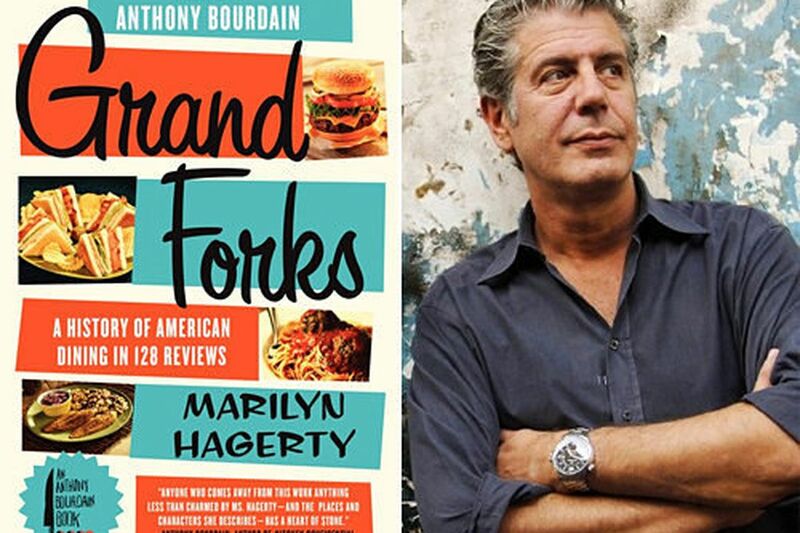 Did you notice in that report that when Hagerty was getting sauteed, celebrity chef known the world over Anthony Bourdain no less came to her defense. After meeting Hagerty for coffee when she was on a media tour in NY Bourdain published a book of her columns. Bourdain died of suicide earlier this month in France. ‘‘I am sorry that Anthony Bourdain died. I’m especially sorry about the way he died,’’ Hagerty told the Associated Press. Hagerty’s been in journalism for decades. She opened herself up for scrutiny with a review that read like it was written by someone in the business for 30 minutes, not 30 years. Hagerty’s initial review of Olive Garden, the instant heat it received, her immediate elevation to celebrity, and the incredible media attention all made this a deserving and very, very cool story. But critics are not Superman. They are not and should not be immune to what Hagerty went through, right or wrong, and believe me, it was nothing compared to what some writers are hit with. I don’t want Hagerty to change her style. She just needs to know what might lie ahead with any given column.